I need some SEO friendly content for a Website focused on astral projection. The website is currently being developed, so we'll need some content asap. 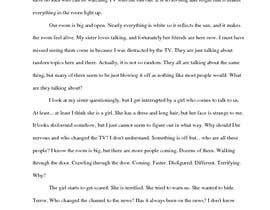 I'm looking for writers who are capable of doing in-depth research on the topic, and who can find interesting angles for writing articles on the topic. The keyword focus is 'astral projection', which is sometimes interchanged with the term, 'out of body experience'. Content must be written by a native English speaker, University educated, and preferably someone who has an interest in alternative topics. A submitted article must be 2000+ words. I prefer to work with self-starting, hard working professionals, who are capable of producing quality work and meeting deadlines. If your work is of high quality, original, and or interesting angles, even if you don't win the contest, I'll consider buying your articles. Hi, have you checked my entry #18? Please comment on my entry and its chances of winning the competition, thank you, I shall be very grateful to you. You're not really a professional, Michailo. You're acting as if you were entitled to win the competition, which has been your tone from the beginning. I've had to manage your expectations a few times on this public clarification board. Please don't ever bother entering one of my competitions again as your behaviour is anything but professional. Hi, I sent corrected work according to your recommendations, please check, thank you. I hope everything is right and I look forward to the results of the competition, thank you. Hi, when can I expect results of the competition, thanks? Sir, please provide a feedback for entry #23 . Good evening, I am unsure as to whether my entry was successfully submitted? HI, do check out #22. I am working on my submission and will upload it before the contest ends. I hope you are going to keep this contest alive till the end. I will not be ending the contest early. Hello, please do check and review my entry #19. Thank you. Hi Saibu. Thanks. I'll have a look. Please, I'm almost done with my entry. Will submit it soon. So, please don't close the contest yet. Thank you. I wont be closing the contest early, so its fine. The Website is all about providing fresh content on the subject of astral projection. I'm not entirely sure about what context you're using the word "introduction", but I've been pretty clear about what I'm looking for in the brief. Original articles on the subject of astral production, which have interesting angles. That leaves room for a lot of creative ideas. Please check my article #5. I hope you liked the idea of combining astral subjects with fiction, thank you. ok, I understand, I will try to improve the text with SEО, but I also hope for your sequence of actions, thank you. I also have other ideas on this topic, I think you will be interesting, but first I should like to approve this article. Please check article#7 and give me your precious feedback. You copied most of the material in your "work", straight from Wikivisually. Please don't think I'm not going to check what you write in Google. It took me less than a minute to find the source of where you copied this information. As someone that occasionally does AP for the purpose of remote viewing - I can also tell you that simply paraphrasing or taking ideas from what is already out there is worse than plagiarism. Without experience in this field - you can endanger others who are reading. If you have never ridden a bike; but must describe how to do so safely - you won't know if what you are reading is right or wrong. Aside from leaving out crucial points - you will also tend to "lift" more text wise. Understand? Just looking through the comments, and not sure how to proceed here. Let's say I want to do an article on 5 Ways to Have an Astral Projection. Anything I write about - say using a guided script - is likely to either be found online or in materials by other authors that have written books on this topic. My exact phrases wouldn't be the same; but the methods are discussed elsewhere. What would make this an original article by your standards? Ok - that's reasonable. I will give this a try. There are definitely some methods for astral projection that don't work for me - so I might just name the method and explain the pros and cons from personal experience. And I agree - the topic is as infinite as the practice. There have already been a few submissions that were either taken in whole or part from other sources. Please know this project is of the utmost importance to me. As such, I WILL CHECK every entry by doing a thorough online check to see if its copied from other works. So disappointed to see so many disingenuous freelancers on this site! Hi, open please chat with me, I got an interesting idea how to present the "astral projection" through literary creation. I mean one of the works of English fiction, where this topic is revealed. I think the readers will be captured by references to literary work. Please contact me, I will give you an idea, if you approve it, then I will be able to present a full article. "Sealed" costs me $30, which is a bit of a scam as it should be a standard feature. Please supply a few hundred words to show you're serious and then I'll pay the $30 to make you feel more confident. OK I accept :) , i will post soon a sample. 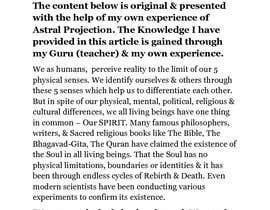 Hi, I would like to write article for you on "astral projection". The contents would be original. Soon I will submit my entry. Yes, it needs to be original, Syed. Hi, from which perspective would you like the articles written in? Can I write referring to my own experiences?